My first review for Drake, and it’s a good one. Publishers Description: Hitman Don Drake owes a gambling debt to a demon. Forced to carry out one more assassination to clear his debt, Don unwittingly kills an innocent child and brings the Furies of Greek myth down upon himself. Rescued by an almost-fallen angel called Trixie, Don and his magical accomplice The Burned Man, an imprisoned archdemon, are forced to deal with Lucifer himself whilst battling a powerful evil magician. 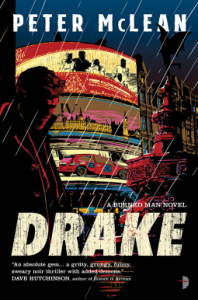 Review: Drake reminds me of an old hard-boiled detective and the setting is reminiscent of said era. Only the hot blonde is a fallen angel that is charged with killing the Furies and a tiny demon familiar called the “Burned Man” that expedites assassinations and suckles blood from his chest.